United Yacht Sales New Jersey would love to guide you through a personal showing of this 114' Cape Scott 114 2019. 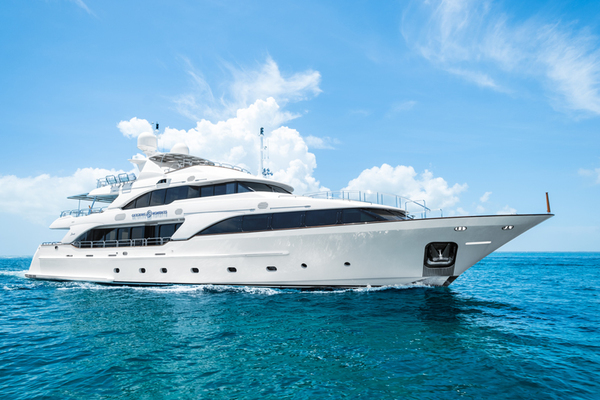 This yacht for sale is located in Danang Vietnam and priced at $15,800,000. For a showing please contact us by filling out the form on this page and we will get back to you shortly! 10 guests in 5 staterooms and 6 crew in 3 cabinsSaloon:Free standing dining table with chairs (Owner Supplied)2 x Built in settees with stowage beneathFree standing Coffee table (Owner supplied)Window blind pocketsBi-parting sliding doors to aft deck with finished white exterior to match the adjacent house sides and with interior paint finish compatible hardwood and veneer.Wall to Wall carpeting. Other owner specified materials including Teak and Holly, Laminate or Vinyl flooring are available on an optional basis, pricing to be determinedPioneer Surround Sound System.AC and 24V DC Halogen BCM overhead lighting. (optional LED lights)Telephone jack.Salon windows are tinted.Carbon monoxide detector and alarm.Wheelhouse:Built-in cabinetry as per arrangement plan.2 x “L” shaped Settees with tablesStowage beneath the seatingAllowance for owner selected Helm Chairs.Two (2) side and one overhead grab rails made from the interior wood selected.Center line helm station with dedicated instrument console, visual bilge water alarm, storage lockers and drawers.Wall to Wall carpeting. Other owner specified materials including Teak and Holly, Laminate or Vinyl flooring are available on an optional basis, pricing to be determined.Engine controls, bow thruster controls,Flat-panel control console styling with engine alarm system and illuminated instrumentation including: engine gauges, hour meters, fuel gauges and navigation light switches.Lighted alarm panel with indication lights for high bilge water, fire and smoke.AC and DC distribution panels.Power-assisted hydraulic steering.Port and starboard doors to the Portuguese Bridge with three (3) ‘dog’ down mechanisms. The doors are flush with the wheelhouse side when closed.Wing stations for docking located on port and starboard sides of Portuguese bridge, Wing station equipment includes engine controls, jog steering, bow thruster control and Rudder Angle Indicator.Laminated clear safety glass heavy duty windshield (frameless recessed design).AC and 24V DC BCM overhead halogen lighting. (Optional LED lights)Steering console and wheelhouse table have blue overhead lights for night navigation.Windshield defroster system integrated with HVAC system.Three (3) electric synchronized windshield wipers, washers and controls.6” Ritchie compass.27” Cape Scott signature helm wheel made from selected Hardwood with Ebony inlay.Telephone outlet and AC duplex receptacle.Smoke detector.Rudder angle indicator.DC 12V socket.Owner stateroom:Built-in cabinetry as per arrangement plan.Full beam arrangementDrawers under King sized berth.Ensuite countertops, owners may choose from Cape Scott selected solid surface (Corian or equal) or Granite samplesEnsuite floor covered in Marble or granite tileCedar lined walk in closet locker with door activated auto-lights.Writing deskVanity with lift up mirrorSeating area on Starboard sidePrivate owner’s office on aft starboard side of stateroom with built in desk and book shelves.Wall to Wall carpeting. Other owner specified materials including Teak and Holly, Laminate or Vinyl flooring are available on an optional basis, pricing to be determinedOverhead Halogen down lights AC and 24V DC. (Optional LED lights)Reading lamps 24V DC (2).Wall to wall carpeting in cabin.Full length mirror on inside of hanging locker door with auto switch lighting.Compact AM/FM mini stereo receiver with DVD player and overhead speakersWall mounted 40” LCD TV.Four (4) A/C duplex outlets in stateroom and one (1) GFCI in ensuiteTelephone outlet.Carbon monoxide detector and alarm.Ensuite with Tub/shower, toilet and 2 basinsBasin cabinet with doorsFrameless Glass door on Tub/showerHeadhunter Royal Flush toiletGuest staterooms:Built-in cabinetry as per arrangement plan.Drawers under each berth.Ensuite countertops, owners may choose from Cape Scott selected solid surface (Corian or equal) or Granite samplesEnsuite floor covered in High quality Vinyl flooringCedar lined hanging locker with door activated auto-lights.Wall to Wall carpeting. Other owner specified materials including Teak and Holly, Laminate or Vinyl flooring are available on an optional basis, pricing to be determinedOverhead Halogen down lights AC and 24V DC. (Optional LED lights)Reading lamps 24V DC (2).Wall to wall carpeting except in ensuites.Full length mirror on inside of hanging locker door with auto switch lighting.Compact AM/FM mini stereo receiver with DVD player and overhead speakers.A/C duplex outlet.Telephone outlet.Carbon monoxide detector and alarm.Three piece ensuite with shower, toilet and basinBasin cabinet with doorsFrameless Glass door on showerHeadhunter Royal Flush toiletCrew Accommodation:Built-in cabinetry as per arrangement plan.Large seating area with tableCooktop and basin and laundry facilitiesCrew public space floor covered with vinyl flooring1 x cabin with two single berths bunks, each with custom made 4” foam mattress.1x cabin with double bunk with custom made 4” foam mattressDrawers under each berth.Compact AM/FM mini stereo receiver with DVD player and overhead speakers.A/C duplex outlet.Telephone outlet in crew mess area.Washer/dryer unit behind doors in the lower companionway (side by side units)Smoke detector. TV/DVD:Main saloon – Sony or equivalent 40 inch LCD HDTV, Pioneer surround sound system. 32 inch TVs in guest cabins, 40 inch in master cabin all with Sony DVD players with IPod docks and Bose speakers. Speakers in wheelhouse and on aft deck. Armored hull construction2 fire stations each with 50ft hoseHydraulically driven Fire/Bilge systemEngine Driven emergency bilge pump with “Y” valve.Six watertight hull compartments.Paired hi/low and alarmed bilge pumps.Alarm repeater panels (w/ indicator lights for Fire, Bilge and Carbon Monoxide) in Wheelhouse and Captains’ Stateroom.Carbon monoxide detectors in each Lower Deck cabin.Fire and smoke sensors in engine room, wheelhouse, lower deck corridor and galleyEmergency air supply damper shut down to engine room.Emergency fuel shut down for engine and generator.Engine room fire suppression system. (FM200)2 x color video cameras, one in Engine room, one on aft deck16 life jackets2 life ringsStorm covers over all port lights. (13) 5lb ABC Fire extinguishers for each crew and guest accommodation areas. (1) 15 lb CO2 extinguisher for Engine RoomExtra heavy duty fittings and cleats.Extra attention to rough weather securing and grab rails.